Watch our video on how to prepare Skillet Potatoes with Bacon and Cheddar to learn how to make an old family favorite exciting again. 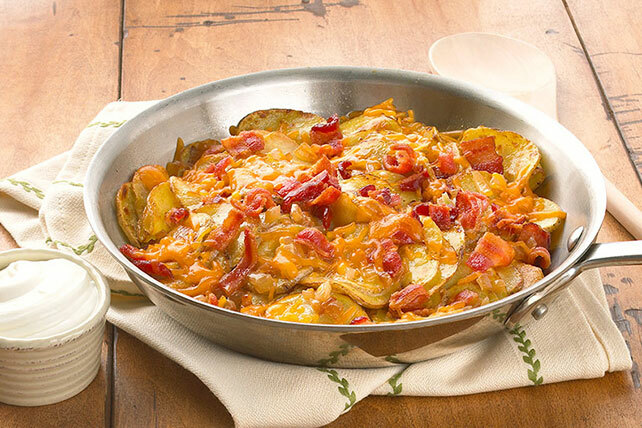 You don't even have to peel any veggies to make our Skillet Potatoes with Bacon and Cheddar! Could great flavor get any more simple? Cook and stir bacon in large nonstick skillet on medium heat until crisp. Remove bacon from skillet with slotted spoon; drain on paper towels. Discard all but 3 Tbsp. drippings from skillet. Add onions to drippings in skillet; cook and stir 5 min. Stir in potatoes; cover. Cook on medium-low heat 20 to 25 min. or until potatoes are tender, stirring occasionally. Top with cheese and bacon; cook, covered, 1 to 2 min. or until cheese is melted. Serve topped with sour cream.